Explore a creative and fun way to put your photos, artwork, and designs onto a variety of surfaces using heat transfers and an inkjet printer. 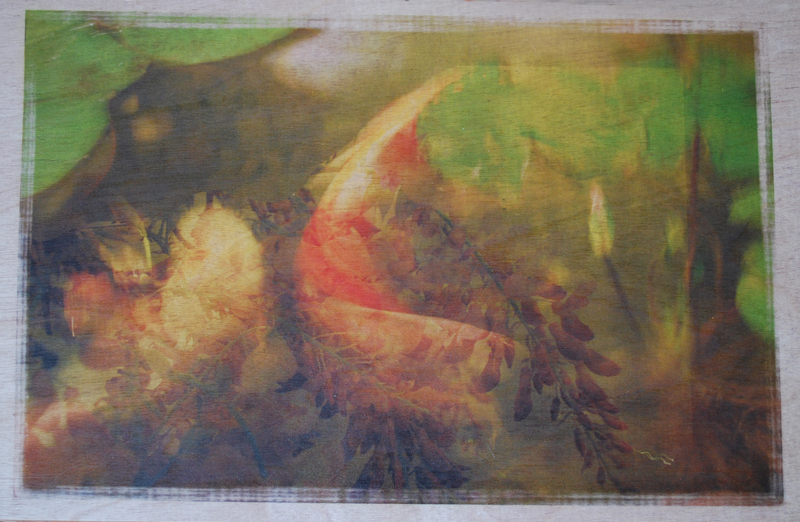 At this hands-on workshop we’ll use several different products to transfer your images onto fabric, wood, tile, and more. You’ll complete at least one transfer at the workshop, and a handout is included so you’ll be all set to make original gifts and artwork on your own. The workshop will be held on Sunday April 28, from noon to 3 pm at The Village Shops and Galleries, 10330 San Pablo Ave., El Cerrito (between Stockton and Eureka). Free parking and wheelchair accessible. $40 plus a materials fee. This is a versatile, clean, and inexpensive way to place your photos and images onto things that you can’t fit through your printer. I’ll show you tips and tricks to get great results from transfers, and introduce you to the best-quality products, including Transfer Artist Paper (TAP), which I used to make the collage box in the photograph at the top of this post. Another heat transfer product I like is made by Lazertran, a company that makes the waterslide decals I use in many of my art pieces. The top of this box is a Lazertran heat transfer. Pre-registration is required for the workshop because I’m limiting the size, so please email me at heidirand@gmail.com. For the complete list of my workshops and other events, go to the workshop page on my website. If you’re not in the Bay Area, you can learn the techniques at my online workshop at CraftArtEdu, Decorating Wood With Image Transfers. 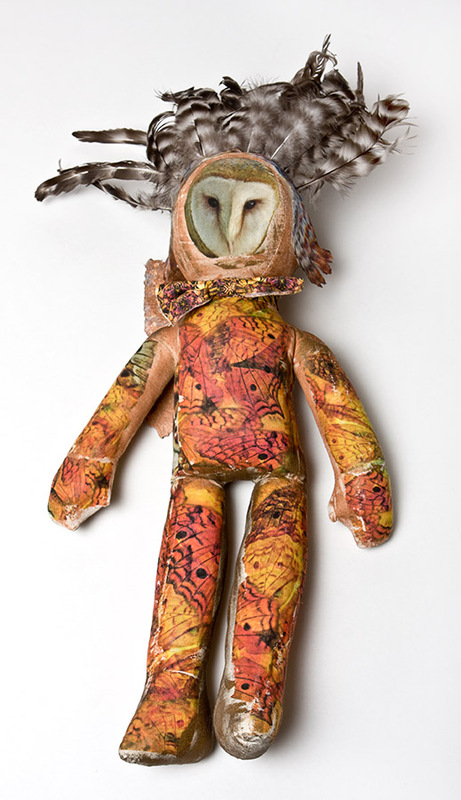 Meet “Wingspread,” a mixed-media art doll that I created, using several different techniques to transfer or attach my original photographs and designs to the soft stuffed cotton doll. 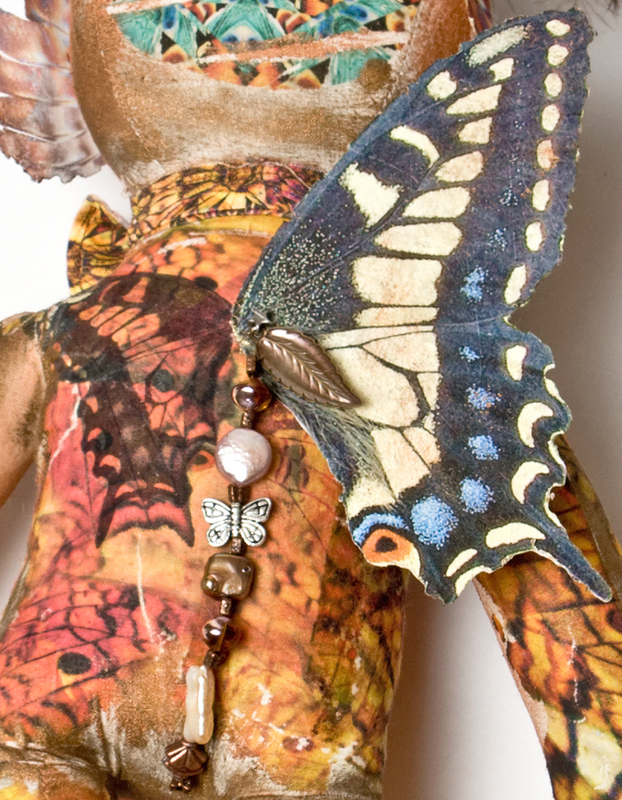 Most of Wings’ body is decorated with fragments of my “Golden Butterfly” photo collage. I used Transfer Artist Paper (TAP) to transfer the Golden Butterfly design to the doll. For the large wing on the right side I printed my photo of an anise swallowtail butterfly’s spread wing on lutradur coated with Golden’s Digital Ground. I stitched the wing to the center of the back. I also added a small metal wing, and a dangle of pearl, metal and glass beads. 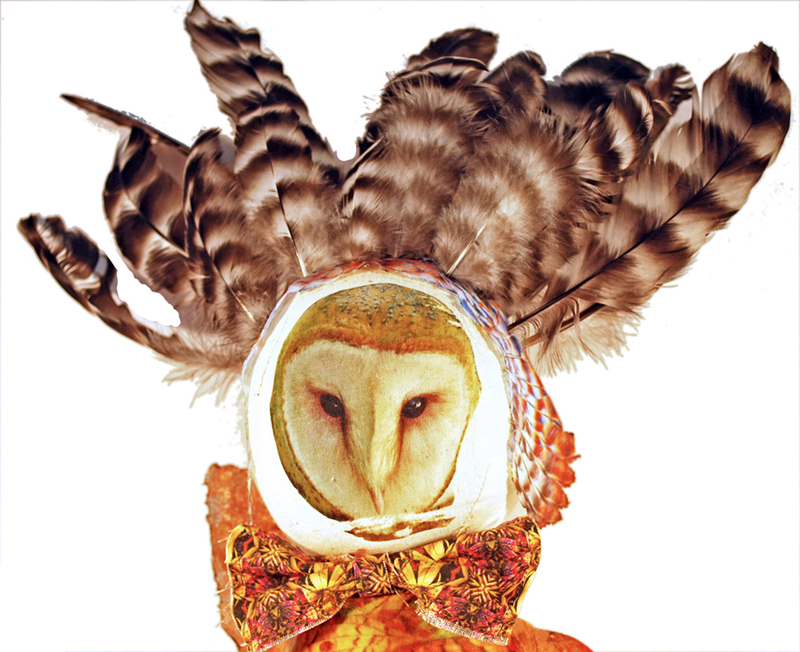 Wingspread’s headdress is made from beautiful black and white striped hen feathers from Barred Rock hens. 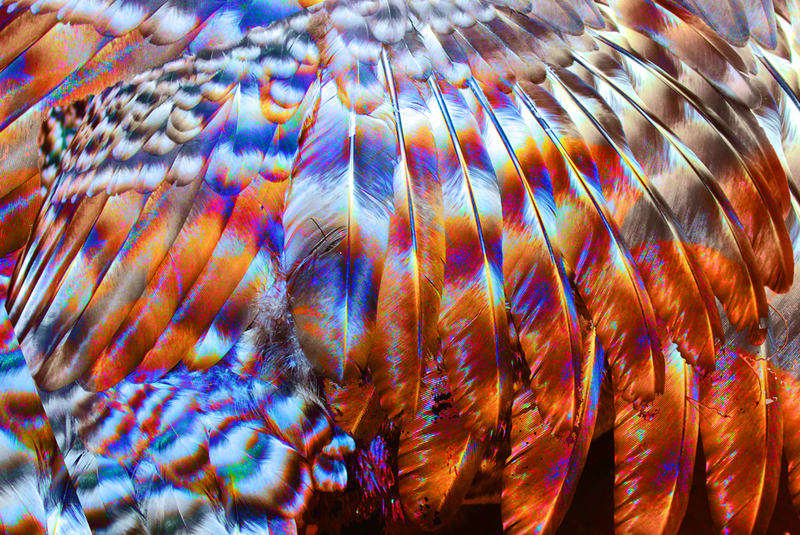 They are affixed to the head through another piece of lutradur, which I printed using my photo collage of the open wing of a Barred Rock hen. Wings wears a colorful bowtie, which I made from my original design fabric. Wingspread is a bit over 20 inches tall, including the feather headdress. 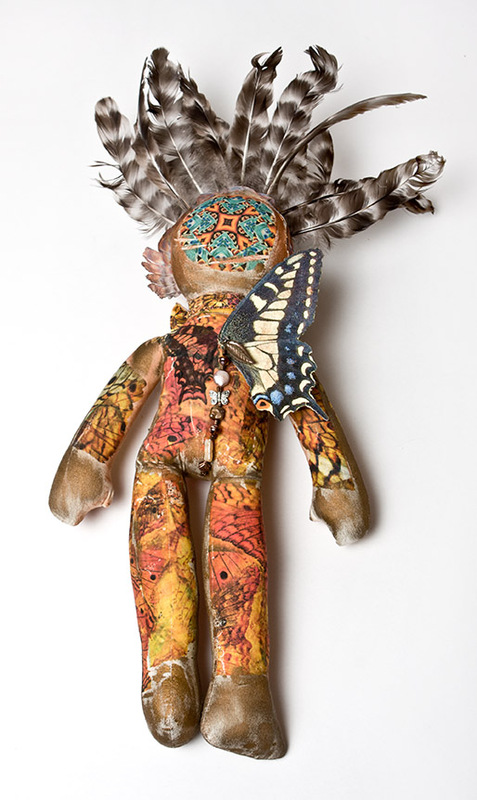 I love art dolls, and it was so fun to make this one, incorporating my butterfly photos and designs, and using so many different techniques and products. 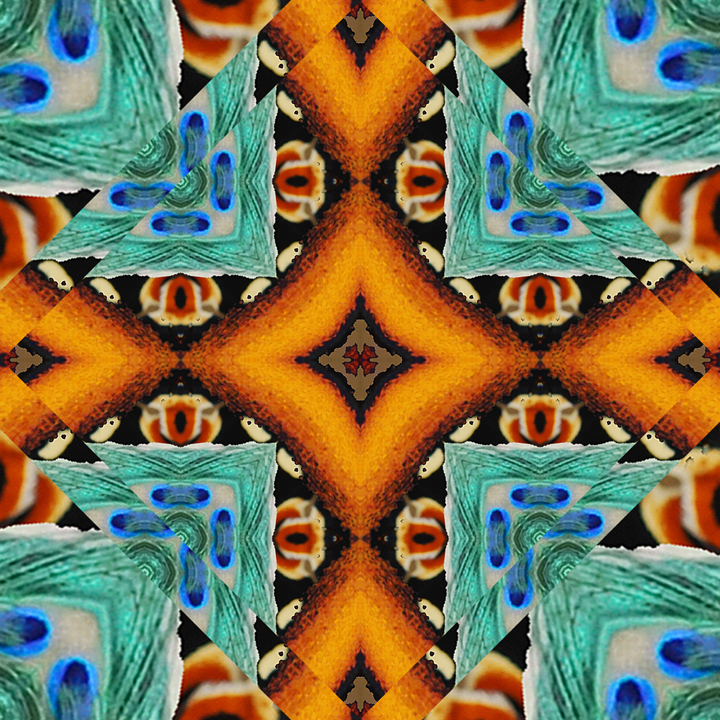 You can see more pictures at my Artfire gallery. Have you ever made an art doll? What materials did you use? I’ve written before about transferring my inkjet images and designs to wood. I’ve done some printing directly onto wood that I treated with Golden Paint’s Digital Grounds, but not much because I haven’t had great success finding veneer that’s flat enough to print. I ordered some veneer online from Rockler, great price – but it was too warped to send safely through the printer, and although I found directions to flatten veneer, I just didn’t have the interest in doing that step on top of all of the others needed to get a good inkjet print. 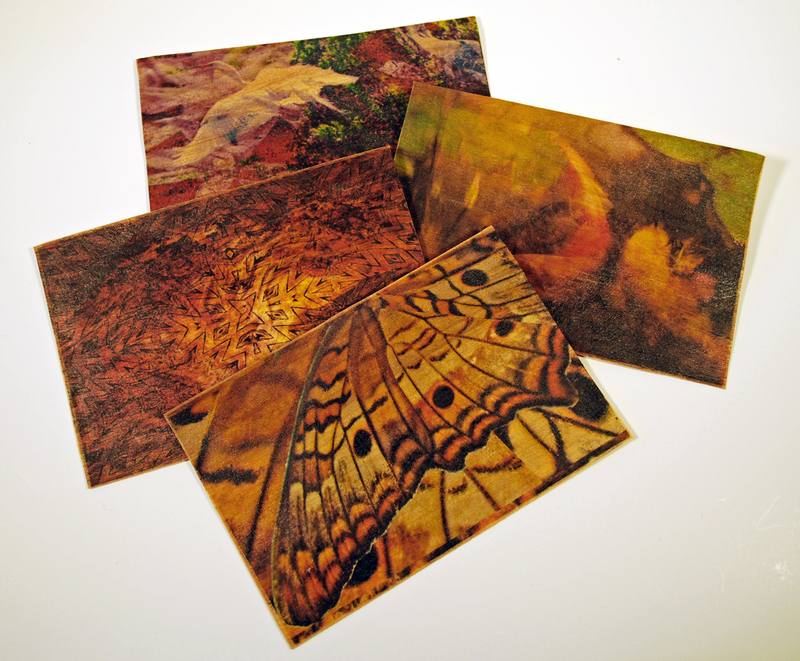 I have been using small flat pieces of the Rockler veneer to make wooden postcards using Transfer Artist Paper (TAP), more about that another day. Oh, okay, here’s a photo of those wooden postcards – I will write a whole post about my process to make those soon. So anyway, I had great hopes for the first inkjet-treated veneer that I’ve found, available through Cards of Wood, called SMartGRAIN™. I was excited that it could go through the normal feed of my small printer. Thicker wood veneer has to go through the straight path of my larger printer. This veneer is thin enough to curl through the normal feed. I got the starter kit from Cards of Wood. Their price for the kit is $25 for 6 letter-sized sheets. After that, you buy them by the sheet, and they’re $5.25 each. They also paid the shipping for the sample kit, which was nice. For my first test, I chose an image that I thought would look good on wood, and one that I had printed on veneer that I coated with Digital Grounds, for comparison. 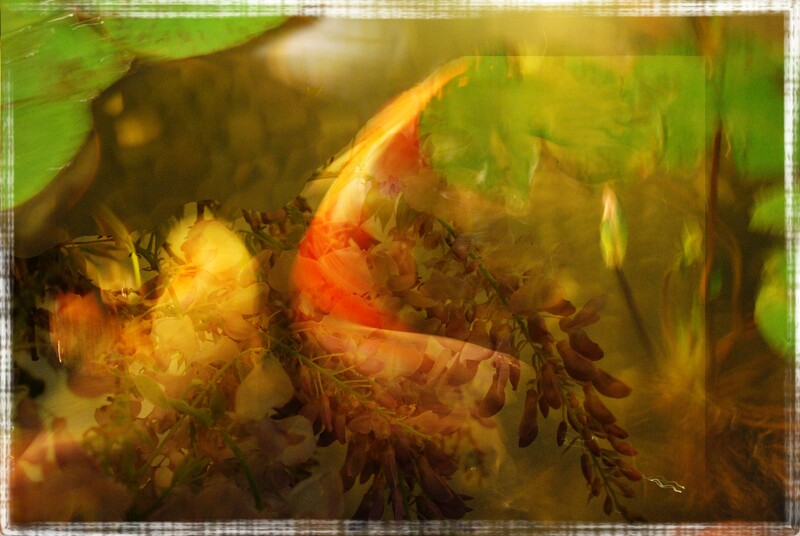 This is the original file for my Koi and Wisteria blended collage. This is the same image printed on veneer that I coated with the clear gloss Digital Ground. 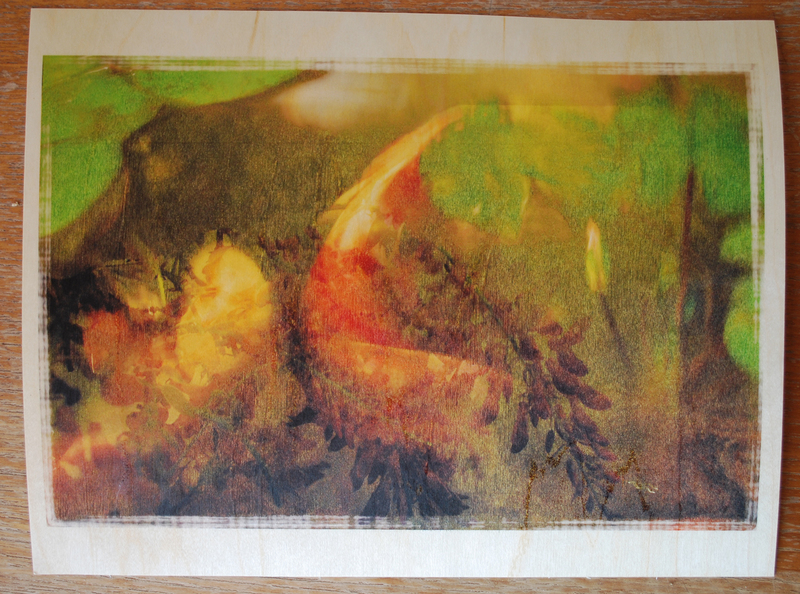 I much prefer the print that I made on the veneer that I treated with Digital Ground. The detail is much better – part of the collage is a garland of wisteria blooms, and the Cards of Wood print is blurry, with no sharp detail. The color of the Cards of Wood print is a bit brighter, and it’s close to the original image file, so that’s good. I’m very finicky about detail and resolution in my prints, though — it’s very important to me, and it shows how good the quality of the inkjet coating is. I should emphasize that I’ve printed on many unusual surfaces, and I never expect that a print on things other than paper will look the same as on good inkjet paper. I do know that the color and grain of the wood will affect the quality of the print. That’s why I did the comparison between the Digital Ground-treated print and the one on SMartGRAIN™ wood. I’m not convinced that the Cards of Wood product is worth the money. I will print the rest of the four sheets and let you know my final verdict. 1 Comment Posted in Inkjet printing on wood Tagged "inkjet print on wood", "inkjet printing", "inkjet transfer", "iron-on transfer", "print on wood veneer", "print on wood", "printing on wood veneer", "printing on wood", "TAP paper", "Transfer artist paper"
Finally – after months of working on classes, taking photographs, writing scripts, narrating, annotating, editing, polishing … CraftEdu goes live in beta today! I’m so honored to be part of this wonderful group of talented teachers, artists and crafters. We’re a diverse group, with something for everyone: lots of jewelry artists of all stripes (Donna Kato, the polymer queen, is our fearless leader), but you can also find classes on digital art, fiber and textiles, encaustic, rubber stamping, mixed media, and much more! Click here to visit CraftEdu. I have two free classes up: Inkjet Inks, What You Need to Know for Your Arts & Crafts; and Introduction to Lutradur. I also have two on demand classes up so far: Inkjet Printing on Fabric and Inkjet Printing on Lutradur. I’m busy working on more. Join my group to ask questions, share ideas, or get information! Learn to make creative and unique artwork, crafts and gifts using heat transfers and your inkjet printer. We will explore several products and techniques to transfer images and text to a wide variety of surfaces. You will complete at least two transfers at the workshop. 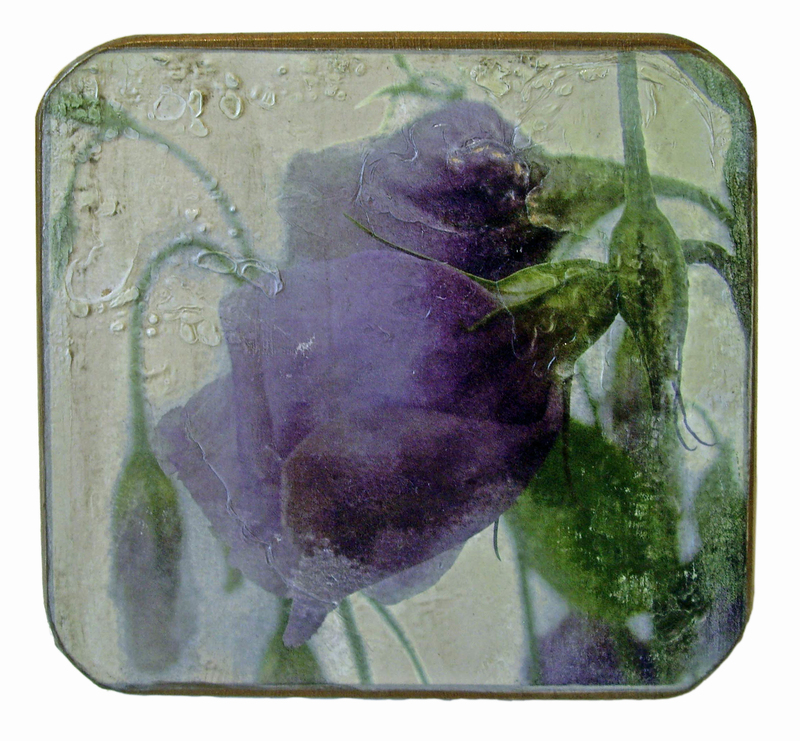 You can use heat transfers on fabric, wood, tile, metal, and many other surfaces. It’s a versatile way to place your photographs and images onto things that you can’t fit through your printer! For best results, I usually recommend using the iron-on transfers that your printer manufacturer offers. There is an exciting new product though, Transfer Artist Paper (TAP), that works very well for transfers. You’ll have a chance to try TAP at the workshop. I made the frame for this lutradur piece with TAP transferred onto a canvas board. Another heat transfer product I like is by Lazertran, the company that makes the waterslide decals that I use in many of my art pieces. The top of this box is a lazertran heat transfer. For more information, or to pre-register, email me at heidirand@gmail.com. For the complete list of my workshops and other events, go to the Calendar on my website. Finishing and framing a piece is always a challenge for me. Since I used new techniques and products for the quilt (more about that later! ), I wanted that novelty to be reflected in the way I framed it. Rooting around in my supply closet, I found wooden framing stretcher strips about the right size. When assembled, the frame was a bit larger than the quilt. To finish the plain wood in a manner that would reflect and honor the quilt, I printed some of the elements of the lavender and rust collage onto Transfer Artist Paper (see my earlier posts about TAP), and ironed them onto the front of the frame. If you’re interested in learning how to print on fabric, check out my online class at CraftEdu. I also offer the class with captioning for the deaf and hard of hearing. 6 Comments Posted in Inkjet printing on fabric, Inkjet transfers Tagged "fabric printing", "framing techniques", "heat transfer", "lavender and rust art quilt", "Pinole Art Center", "Pinole Artisans", "printing on fabric", "TAP paper", "Transfer artist paper", art quilt, “fabric printing”, “printing on fabric”, DIY, frame, framing, hanging, iron-on, nature, original design fabric, photography, ribbon, self-designed fabric, Too"
Sunday September 13th – noon to 3:30 p.m. Learn ways to create personal art with this exciting new product that combines the best qualities of fabric and paper. Lutradur looks, feels and folds like translucent paper and doesn’t tear or fray. It’s the perfect medium for a wide variety of mixed media art, crafting, and sewing. 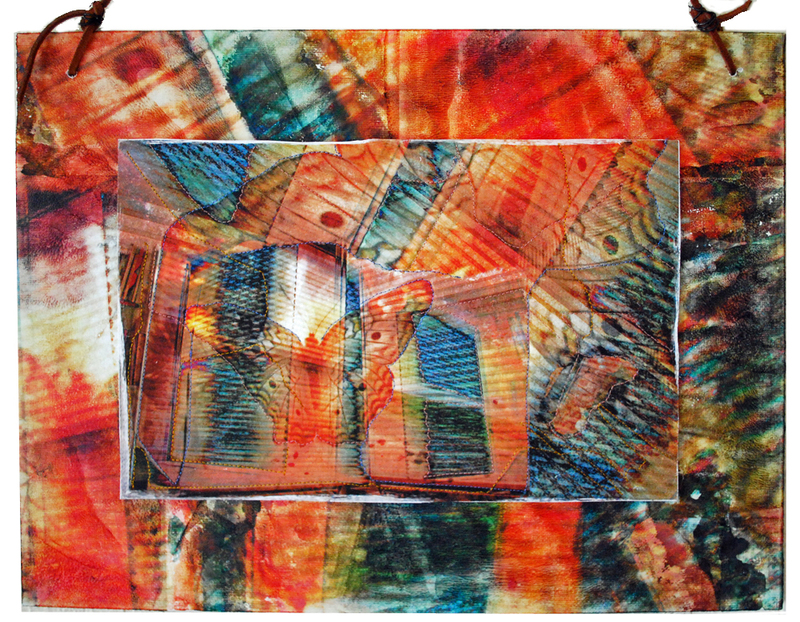 You will have time to explore a variety of effects to create a mixed media art project. I will provide paints and other basic supplies. Bring your favorite art materials to try on lutradur, as well as any photos, beads, etc. for your personal project.